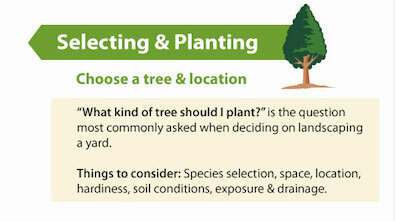 If you’re landscaping, you might be confused about how to choose the best tree for your yard. For sure, finding the proper tree can be problematic if you don’t know much about what grows where, but with a little help, you’ll get it right. The first thing you’ll want to think about is the size of your lot, and what you expect from your tree. If you have a huge property, you can probably plant pretty much whatever pleases you, wherever you like. If you’re on a small, urban or suburban lot, then it becomes a bit more difficult. Often, on small lots, and particularly in new subdivisions, the soil is compacted and substandard, so you can’t select a tree that’s going to need a lot of room to grow or that requires a lot of space for its root system to spread out – more than one homeowner has planted a spreading tree and lived to reap the adverse consequences of broken basement walls or up-lifted sidewalks in the front of their home. On small lots, your best bet is low-growing trees that don’t demand a lot of root space. Remember, whatever you see above the ground within the canopy, roots can grow up to two or more times that distance from the trunk. For small lots, or where growth under power lines is a concern, you’ll want to select something that grows slowly. You’d probably like your tree to provide you with a lifetime of enjoyment, and if you just have to cut it down in fifteen or so years when it grows up into the power lines, it defeats the purpose. Small trees, like crabapples, dogwoods or serviceberries, will provide you with attractive hardwoods. Most evergreens can be easily pruned back and used to create hedges rather than tall-growing single stems. If you’re on a small lot, it might be important for you to have a good source of shade in the summer, but you’ll want light and warmth coming into your house during the winter. The best choice is a deciduous tree – the kind that drops its leaves in the fall. If you have more room, you can choose a mix of trees that will offer shade and sun, and also privacy protection – in short, a mix of deciduous and evergreen trees. Some trees do very well in poor soil. Others need a little help. However, most trees don’t need MUCH help, and you can actually cause harm by over-fertilizing. “High number” fertilizers can often contain far too much nitrogen for healthy tree growth, so to start with, go with something gentle like 6-6-4. You can always upgrade later if you think your tree needs it. When in doubt, contact an arborist for a soil test and consultation. Once in a while, even in the face of all the best advice and all your best intentions, you’ll get it wrong, and place a tree in a location that simply doesn’t suit it. When that happens, you’ll have no choice but to dig it up and move it to a more suitable place. Keep in mind that the older the tree is, the less effectively it will respond to being transplanted. So be very careful of the root structure, dig a deeper, wider hole than you would for a new transplant, and make sure that once you’re re-planted the tree you water vigorously and provide mulch. With proper care, your tree will flourish in its new location.